URGENT >> BULLETIN >> MOVING: (11th Update 9:43 p.m. EDT U.S.A.) The court-appointed receiver in the Zeek Rewards Ponzi- and pyramid case has sued MLM attorney Kevin Grimes and the Grimes & Reese law firm, alleging malpractice, negligence and breach of fiduciary duty. In another action concerning a professional who worked for Zeek or was associated with purported “opportunity,” the receiver has sued attorney and tax consultant Howard N. Kaplan. Zeek operated an MLM “program” tied to a purported penny auction. As is the case in the Grimes action, the receiver is seeking a sum of more than $100 million against Kaplan for alleged damages. Both Kaplan and Grimes should have known better, but nevertheless helped Zeek thrive while helping Zeek gain unwarranted credibility by lending their professional reputations to a fraud scheme that gathered hundreds of millions of dollars, receiver Kenneth D. Bell alleged. “By virtue of his knowledge of [Zeek operator Rex Venture Group] and ZeekRewards and his legal expertise, Grimes knew or should have known that RVG was perpetrating an unlawful scheme which involved a pyramid scheme, an unregistered investment contract and/or a Ponzi scheme. Despite this knowledge, Grimes actively encouraged investors to participate in the scheme by creating a so-called ‘compliance’ program that provided a false façade of legality and legitimacy and knowingly allowed his name to be used to promote the scheme,” Bell said in the complaint against Grimes. Bell accused Grimes of turning a “blind eye” to markers of fraud at Zeek such as unusually consistent payout percentages. And Kaplan, Bell alleged, “knew or should have known that insufficient income from the penny auction business was being made to pay the daily ‘profit share’ promised by ZeekRewards. Instead of properly informing Affiliates of the different tax implications they would face if their Zeek payments were properly characterized as coming from an ‘investment’ rather than a ‘trade or business,’ Kaplan failed to inform Affiliates, either on the calls or in his FAQs, of the material fact that payments to Affiliates should be characterized as investment income for tax reporting purposes. For example, in the FAQs that he drafted and allowed ZeekRewards to post to its website, Kaplan advised that Affiliates should use IRS Schedule C (“Profit or Loss from Business”) to record their income, making no mention of the fact that they should use IRS Schedule D (“Capital Gains and Losses”) . . . If Kaplan had candidly disclosed the material fact that Affiliate income would be properly characterized by the IRS as capital gains, the obvious negative tax implications would have caused many Zeek Affiliates to remove their cash earnings from the program rather than reinvesting them, short-circuiting the scheme much earlier. Since he did not, Affiliates were placated in their misguided belief that ZeekRewards was a lawful program. It has been a remarkably awkward time for MLM attorneys. Gerald Nehra, Richard Waak and their law firm have been accused by plaintiffs in TelexFree-related litigation with racketeering and violations of the federal securities laws. TelexFree plaintiffs have asserted Nehra also counseled Zeek. Defendants played an indispensable role in the scheme. Because of the lucrative, seemingly ‘too good to be true’ claims being made by RVG and ZeekRewards, many potential investors were skeptical of whether the scheme was legal and legitimate. So, RVG enlisted the aid of Grimes and other legal counsel to assist in promoting and legitimizing the scheme. ‘compliance course’ specifically designed to encourage investors and potential investors to believe that if they satisfied the course then it would be a lawful enterprise. Thus, Grimes knowingly allowed Zeek to portray a false appearance of legality through his bogus ‘compliance’ course. 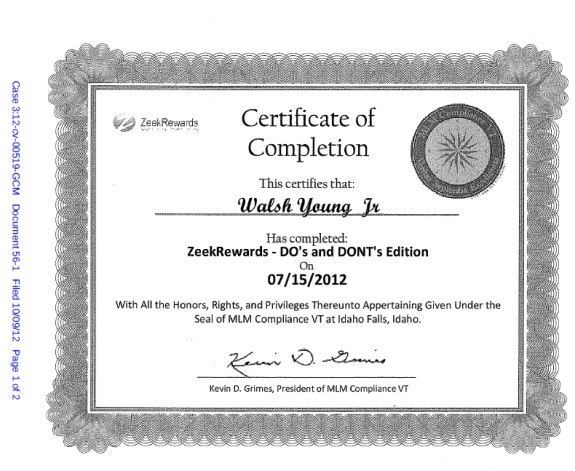 Grimes profited personally from the compliance courses while allowing ZeekRewards yet another source of investor money. Upon information and belief, Grimes received payments from ZeekRewards not only for his legal counsel, but also for sales of his compliance course to Affiliates. Upon information and belief, Grimes provided the compliance course to ZeekRewards for $5 per affiliate, while allowing ZeekRewards to charge affiliates $30 each for the course, personally profiting from it and allowing RVG yet another means of extracting money from unsuspecting Affiliates. Both Grimes and Kaplan were aware that the Zeek “program” raised issues about the sale of unregistered securities, but nevertheless marched forward, Bell alleged. Grimes, Bell alleged, appeared to have “no concern” about the affiliate’s email. The MLM lawyer “took advantage of the situation, creating and marketing a compliance training course as window dressing for this illegitimate scheme, allowing the course to be sold to the Affiliates for his own profit,” Bell alleged. And the sound you just heard was Gerry Nehra’s howls of disbelief when he sees that Ken Bell is asking for $100 million from Grimes and Reese. No matter the outcome of this suit the vaunted MLM Expert Attorneys are all on notice now, rent your rep to the pimps and you can get slapped. How does it feel now Gerry? You thought you had “firm legal footing” to stand on a stage and tell TelexFree’s soon to be victims that TelexFree was on “firm legal footing.” And you let them use your legal reputation to help sell their scam. I hope you got paid very well Mr. Nehra, you sure as hell have no legal excuse for not knowing where that money came from. I can only hope that ken Bell’s suit against Kevin Grimes is just the first so richly deserved prosecution of this type. If I am not mistaken, Gerald Nehra also provided legal advice to Zeek Rewards around the first part of 2012. I also bet that Keith Laggos is sweating bullets too. This is far from over with the legal filings against the major players behind the curtain in Zeek Rewards. I do wonder what Zeek figure Robert Craddock is thinking tonight — I mean, after he appears to have licensed himself to use Kevin Grimes’ shingle to put a scare in K. Chang. It also seems that ZR doesn’t cotton much to critics. A gentleman who posts under the screen name of K. Chang writes the “A MLM Sceptic” blog recently has seen his “Hub Page” blog about ZR removed by a take down notice from someone claiming to be a representative of ZR and informed that ZR’s legal council (Kevin Grimes) would “want to weigh in” on this situation. It is always good to hear from you, Glim. Craddock and Laggos are small fish compared to Grimes and Kaplan, both of whom obviously have some sort of liability insurance that’ll pay up. Lawyers are required to, right? Like mandatory fee to state bar? Now Nehra and Waak is probably next, IMHO, THEN maybe Laggos. Craddock can say he was just following Caldwell’s orders. ;) Though his setting up a leads-for-sale site sort of belies his “insider” status. Many, many thanks for your fine coverage of Zeek plus the wonderful comments of bloggers. This is really going to be a barnburner. Now I will sit back and watch Mr.Bell untangle a web of crooks that swindled thousands of innocent people. And to add insult to injury, these crooks would quickly tell you of their religious convictions. What a bunch of creeps. Bell is my knight in shining armor and to me, no cost is too great to bring these people to justice. Quick notes: One of the early talking points from the MLM sidelines collapsed even before it was made, something worth noting. The specific talking point was that the receiver simply was asking permission to file the lawsuit against Grimes, so reports that the complaint had been filed were premature. From this, folks following the Zeek case were led to believe that the critics once again had gotten it wrong. It is true the receiver, on June 25, sought permission to file. But it is equally true the judge granted it on the same day and that the receiver filed the complaint on the same day. The information in the story above comes from the complaint, which became a public record on or before 7:03 p.m. EDT on June 25. It is understandable that some folks in MLM are not enthusiastic about this lawsuit. But it was silly to plant the seed that the critics once again had gotten it wrong, especially since those critics had a copy of the actual lawsuit from a PUBLIC source BEFORE they wrote about it. So, while the critics were reading and quoting from the actual lawsuit, the strange talking point was circulating in MLM circles that the complaint hadn’t even been filed. Imagine that the early talking point had gained a viral head of steam and that dozens or even hundreds of MLMers had Tweeted or Blogged that the critics had gotten it wrong and that the lawsuit hadn’t been filed. There could have been thousands of points of misinformation. This appears, thankfully, not to have happened. Had it occurred, however, it easily could have led to a TelexFree-like situation in which members effectively made false reports go viral. The TelexFree story is very much like the AdSurfDaily story in this respect: members circulated false or less-than-true reports and contributed to a sea of misinformation on the web. A second talking point from the MLM sphere on the Grimes matter may be equally troubling. The early narrative on that one wholly ignores the receiver’s serious allegations and bizarrely posits that only MLM companies that do not need lawyers will get them. If these talking points that for now appear to be the confection of one person somehow evolve into the MLM trade’s talking points, well, God help the trade. Bob Mercer: Many, many thanks for your fine coverage of Zeek plus the wonderful comments of bloggers. Very much appreciate your readership and your kind words, Bob.